When I was still in school, I have often claimed that I do excel on all assigned tasks except Math. I find mathematics difficult because it is abstract and I find abstract problems quite difficult to comprehend. I cringed at the thought of solving actual problems or proving theorems because these yield definite results. And the reality often sets in--Mathematics is not an option. Students are taught mathematics regardless of interest and each one must learn it to some degree. Since Math is a cumulative discipline, I then had to focus more on mathematical building blocks to understand every single concept. 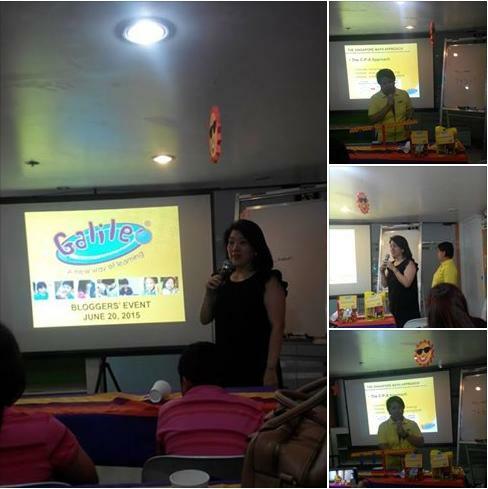 Last June 20, Galileo Enrichment Learning Program CEO Ma. Rowena J. Matti hosted a Singapore Math orientation for parent bloggers and kids. 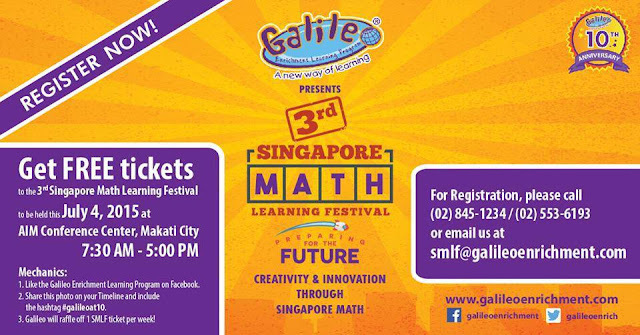 Singapore Math is a teaching technique based on the Singapore's national mathematics curriculum used for kindergarten through sixth grade. In this aapproach, students learn and master mathematical concepts using a three-step learning process: concrete, pictorial, and abstract. Bundling up meaning into abstract symbols can be easy if students were taught math properly during early childhood training. Moving on with a clear understanding of Math foundations will empower kids to enlarge their framework of knowledge. Galileo discussed its key teaching methods, guiding principles and available programs on Math and English. 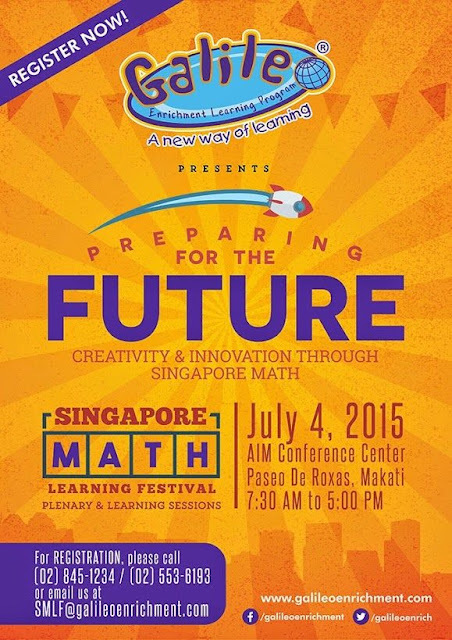 Miss Matti also talked about the 3rd Singapore Math Learning Festival, which is slated on July 4, 2015 (7:30AM - 5PM) at the AIM Conference Center. The SMLF conference will be a venue to further educate parents, teachers, educators and school administrators with creative and innovative teaching strategies in using Singapore Math for creativity and innovation. Plenary Speakers include Dr. Queena Lee-Chua (Ateneo professor and award-winning mathematecian), Gail Tan (Google Philippines Communications Manager) and Ann Marie Wongchuking-Pato, Education Curriculum and Design expert from the National Institute of Education (NIE) in Singapore. Metro Manila residents can snag FREE tickets to the 3rd Singapore Math Learning Festival by following @galileoenrich on twitter and liking the Galileo Enrichment Learning Program Facebook page. One (1) SMLF ticket will be raffled off every week until July 3, 2015. You may call Galileo for more information. This would really be a great way to sharpen up on math skills and learn more about math. So true! Mathematics makes the whole world go round and round. Now, if only mathematics would like me too. I was amazed at how easy to is to solve Math problems with Galileo. I also wished I've learned about it when I was at school.